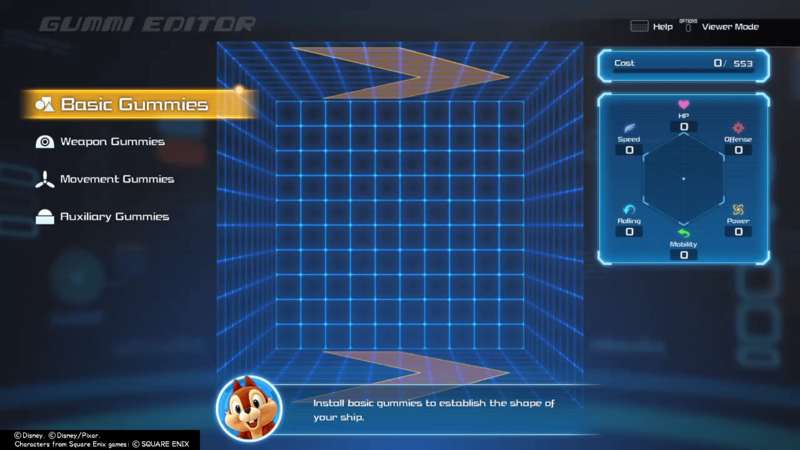 Gummi Ships helps Sora, Donald, and Goofy freely travel across different worlds. Gummi Ships can be customized anytime but it is better to have multiple to increase your stats. Blueprints and Gummi Blocks can be found in outer space, by opening treasure orbs or buying them in shops across different worlds. Progressing through different worlds of the game. Buying blocks from Huey, Dewey, and Louie in Twilight Town. Accomplishing Gummi Missions and reaching high scores in Gummi Ship battles with the Heartless. Writer’s Note: We will be updating this list as we finish the game further. Thank you! ???? Each Gummi Block has a particular set of stats that stacks when put together to form a Gummi Ship. Refers to Hit Points: the amount of damage the ship can withstand before getting destroyed. Refers to the amounts of shots a Weapon Gummi block can provide when fired. Refers to the amount of damage a block can provide in one hit. Refers to the how fast the Gummi Ship moves upward, downward, and sideways. Refers to how fast the Gummi Ship turns/spins. Refers to how fast the Gummi Ship travels forward. Base Gummies are core Gummi Blocks that help build the shape of your Gummi Ship. It has four sub-categories of Angular, Rounded, Cylindrical, and Aero gummies. Angular Gummies are gummi blocks with sharp edges. Rounded Gummies are gummi blocks with rounded edges. Cylindrical Gummies are cylindrical shaped gummi blocks. Aero Gummies are gummi block panels that improve your Gummi Ship’s rolling capability. Weapon Gummies are gummi blocks that enable you to hit enemies. It has three sub-categories of Cannon, Laser, and Impact gummies. Cannon Gummies are gummi blocks that enable you to fire numerous projectiles at enemies. Laser Gummies are gummi blocks that enable you to fire lasers at enemies. Movement Gummies are gummi blocks that allow for movement and maneuverability of your Gummi Ship. It has three sub-categories of Engine, Wing, and Wheel gummies. Auxiliary Gummies are gummi blocks that provide unique special functions to your Gummi Ship. It has three sub-categories of Cockpit, Option, and Figure gummies. Cockpit Gummies are gummi blocks that enable you to fire waves to enemies. Option Gummies help reveal HP of large Heartless. Does anyone know how to get the 6th option gummi block? Where are the Neon orb gummies obtained? I have everything except the cat tail gummi, where do you get it?